For the second half of this Emyn Muil scene, a reflection on the film scene is followed by screenplay excerpt and the caps. After the caps is the excerpt from "The Taming of Sméagol", followed by a short essay on aspects of the book scene. Continuing from my remarks about the first half of this series ("Now that I see him, I do pity him"), although its is still a great film scene, the second half is marred by Sam’s excessive violence towards Gollum. That is, it is marred for me as a book fan. Film Sam is far readier to express antipathy for Gollum with his fists. Frodo has to haul him off a number of times in the course of the films, lest Sam kill their guide. Film Gollum is tied by the neck, not the ankle like in the book. Sam drags him along like a dog. No, I take that back. I can't imagine anyone dragging a dog like that, not without being admonished by some passer-by (Frodo's role). But Gollum resists, complaining bitterly of the pain of the rope. “I don’t believe you!” Sam yells, so sharply that Gollum is startled and tries to bolt, springing up a large boulder. Sam yanks him back with enough force that Gollum falls, crashing to the rock-studded ground on his naked back. Mercifully, Frodo springs immediately into action. “Sam!” he shouts, holding Sam back. This moment is the first example of the writers “upping the ante” for the scenes between these three characters. The added violence sharply intensifies what will be the ongoing dynamic of Sam being antagonistic, Gollum hating Sam in return, with Frodo stuck as mediator. In the scene Sam doesn't actually end by beating Gollum (that comes later, in RotK), but he yanks Gollum down from the rock with enough source to have done him real injury. Granted, film Gollum has already jumped the sleeping hobbits, biting and throttling Sam. I suppose film Sam has been given extra cause to be harsh. But for me Sam's behaviour is over the top and mars the scene, making Sam look like a brute and garnering more sympathy for Gollum. This moment in the scene made me miss the EE "box of salt" scene I just presented all the more, since it shows Sam in such a sweet, endearing light. Ah, well, no use crying over spilt celluloid. After the gratuitious violence is out of the way, however, the scene is once again first-rate. In fact, it’s a beauty. Going on, Sam has been restrained, and Frodo is shown slowly but steadily advancing towards Gollum, as he might approach a wounded beast. Gollum crouches, wary and unsure, on the ground. Frodo’s head and face is not in frame; everything is conveyed by body language, the scene illuminated by more of the soft, white light spilling from above and behind. When Frodo crouches before him to lift the rope over his head, Gollum holds very still. The close-ups show that Frodo's quiet, reassuring treatment has won Gollum over (as well as the rest of us). Sam scowls in a gratifying manner in the background, deservedly thwarted. There's a wonderful rhythm to the scene, too, after Frodo's slow walk towards Gollum. He closes in, and the scene, already slowing down, slows nearly to a stop, or a series of stops. "You know the way to Mordor?" (Frodo's remarks are spoken more like statements to be affirmed than true questions). Beat. "Yes." Beat. "You've been there before." Beat. "Yes." Beat. "You will lead us to the Black Gate." Then there's an extra-long beat, held until the shot changes to the hobbits leaping after Gollum, who suddenly is off and away like shot from a sling. I just love that slowed-down counterpoint. When Frodo gets to his final remark, “You will lead us to the Black Gate”, it resonates for me like a satisfying chord at the end of a chamber piece. And I love how, as the scene gets slower and slower, the two characters draw nearer and nearer, until they are literally close enough to embrace. All the while the close-ups getting closer and closer, intensifying the effect. Really, it's a great scene. And did I mention that Frodo is absolutely, breathtakingly, heart-rendingly gorgeous throughout? Film scene: The Emyn Muil ~ Gollum agrees to show them the way to Mordor. Sam: (To Gollum.) Get down! Sam: (To Frodo.) He’s trying to trick us! If we let him go, he'll throttle us into our sleep! Frodo: (Frodo turns away and advances towards Gollum.) You know the way to Mordor? Frodo: (Lifting the rope over Gollum’s head.) You will lead us to the Black Gate. Gollum gallops off and the hobbits hurry after him. Gollum: To the Gate, to the Gate, to the Gate the master says. Yes! These screencaps taken from a widescreen edition of TTT have been cropped and adjusted for brightness, contrast and focus. Book scene, continued, from "The Taming of Sméagol". Frodo and Sam settle down as if to sleep. As they expected, Gollum tries to bolt, and they spring after him, subduing him. Frodo suggests using the rope. Sam wants to tie it around Gollum’s neck but Frodo says no. Tying one ankle will do—they want him to be able to walk. But once it is tied, Gollum begins to scream horribly, writhing, and trying to bite through the knot. Frodo examines the rope, which is loose enough, but Gollum keeps on screaming. Frodo drew himself up, and again Sam was startled by his words and his stern voice. ‘On the Precious? How dare you?’ he said. ‘Think! One Ring to rule them all and in the Darkness bind them. Gollum cowered. ‘On the Precious, on the Precious!’ he repeated. ‘And what would you swear?’ asked Frodo. For a moment it appeared to Sam that his master had grown and Gollum had shrunk: a tall stern shadow, a mighty lord who hid his brightness in grey cloud, and at his feet a little whining dog. Yet the two were in some way akin and not alien: they could reach one another’s minds. Gollum raised himself and began pawing at Frodo, fawning at his knees. ‘We promises, yes I promise!’ said Gollum. ‘I will serve the master of the Precious. Good master, good Sméagol, gollum, gollum!’ Suddenly he began to weep and bite at his ankle again. ‘Take the rope off, Sam!’ said Frodo. First off, I must proclaim how much I love the picture of Frodo in the beginning of this passage: astute and under no illusions about Gollum, yet wise. He manages to be merciful yet not a fool. Frodo, it says, looked down on Gollum with "stern pity". I wonder, reading this yet again, if Frodo's extension of "stern pity" is what he would wish for himself, should he be reduced to Gollum's state? That is to say, that he would wish to be shown compassion, but not permitted to commit evil, if it could be helped—evil that he very well would wish to do if he should became enslaved to the Ring. I also love that Tolkien notes that Sam was "gentler than his words". As to the second part of the passage, the scene in which Frodo appears to be transfigured before Sam's eyes, I have given it much thought. I will say more when I get to the bookend scene in RotK, very closely related, on the slopes of Mt. Doom just after Frodo repulses Gollum's attack. From my first reading decades ago I was as impressed as Sam by Frodo's show of authority in this scene, portrayed as nearly divine, with its vision of lordly might and brightness hidden in grey cloud. I felt almost a physical thrill reading it. Nevertheless, the scene made me uneasy. For a moment it appeared to Sam that his master had grown and Gollum had shrunk: a tall stern shadow, a mighty lord who hid his brightness in grey cloud, and at his feet a little whining dog. Frodo revealed as a mighty lord, and Gollum as a little whining dog, just doesn't sound like the revelation of anything good to me, not in a Tolkien story. The contrast is more extreme and more unmistakable in the Mt. Doom "transfiguration", but the same elements are present here. The two were in some way akin and not alien: they could reach one another’s minds. What was akin between them in Sam's eyes? The film stressed empathetic identification between Frodo and Gollum. I think what is "akin" is the Ring. But since none of the characters can see it, including Sam, and we are seeing the events through Sam's eyes, it's difficult for the readers to see it, too. My impression of this scene is that in this moment, very subtly, both characters are shown under the Ring's sway. Gollum is bereft of it, and longs for it, abasing himself before its bearer. I think Frodo, if momentarily, in this moment becomes more than just the bearer, as seen in this perception of him as a "mighty lord", his "brightness" hid as in cloud. I don't think the brightness being cloaked is Frodo's renowned "inner light", which Frodo never sought to cloak at any other time (being unaware of it). It is Sauron's brightness, his own perverse sort of glory that is making itself manifest when Frodo, grasping for a way to make Gollum obey, resorts to the authority of the Ring. Frodo does not mean to do ill, of course, only good. But that's what Gandalf and Galadriel said would happen, that is how it would begin: a good person would use it wishing to do good. But it would not end there. Even Sauron, said Gandalf, had not always been evil, but once had been bright and fair. Later, in the pass of Cirith Ungol, Sam is tempted by the Ring. The temptation of Sam is the closest look the reader gets from Tolkien of what it would be like for a good person to be tempted by the Ring. Sam, just as Gandalf had said would be the case, is tempted to do good, not evil. He becomes enlarged in his own self-vision, swelling into a heroic Sam—a mighty lord, in fact—who would restore the wastes of Mordor, even the whole world, and make it a garden. The Ring's influence is not as strong or as obvious as this in the Emyn Muil, yet I think Tolkien shows the reader here the first glimpse into what the Ring might work in Frodo: precisely in this moment when he exercises his authority as "Master of the Precious." This is what Gollum sees, and responds to. Gollum raised himself and began pawing at Frodo, fawning at his knees. Gollum will serve the Master of the Precious, yes. But it is plain "Frodo of the Shire" who will stir Sméagol's finer feelings, bringing him to the very brink of Pity on the Stairs of Cirith Ungol. The "Master of the Precious" who appears to him in cloaked glory amid the rubble of the Emyn Muil, before whom he fawns and grovels, is not that person. ~ The Emyn Muil, Pt. 2a ~ "Catch it, Mr. Frodo!" plus jan-u-wine's "A Gardener's Gift". ~ The Emyn Muil, Pt. 3-b ~ "You know the way to Mordor." ~ Entries with Frodo & Elijah Wood screencaps. ~ Art Travesty LJ entries. ~ ALBUM of all Art Travesties (images only). They are really beautiful, aren't they? Such expressions--and on such a face! The Two Towers is full of fantastic Frodo screencaps, largely taken from scenes many fans have difficulty with, a little or a lot. It's almost a testament to EW's eloquence as a facial actor, and his sure, sympathetic instincts as a person (never having read the book! only following directions and the interpretations of the screenwriters! ), that he was able to put so much of "the real Frodo" into his scenes, no matter what he was made to say or do. Yes, the lighting is blessed. Many thanks (again) to the cinematographer and director of lighting. Mechtild, I'm just making my way through your recent wonderful essay/screencap series. What a fantastic read and feast for the eyes! There's a wonderful rhythm to the scene, too, after Frodo's slow walk towards Gollum. Thank you for pointing out the rhythm of Frodo's and Gollum's exchange. Yes, it's spot on when you say it's like a chamber piece. You put such observations always so, so beautifully. And just before that sequence, when Frodo lifts the rope over Gollum's head, there is a touching tenderness between the two. I love that. Whiteling! Greetings! Yes, I love the tenderness of the lifting of the rope, too. I wonder if they had him lift the real rope from the head of Andy Serkis, and then digitally erased him, like in the scene when Gollum jumps them in the Emyn Muil? It sure looks real--both the physical match and the connection between the actors. Great post, Mech! I like what you say about Frodo looking lordly in a Sauron-like way. That's disturbing. And apt. Thank you, Peachy. Yes, his face! In the top caps, even more than in the ones in which he actually says the lines, "Now that I see him, I do pity him" (posted in the previous entry), I feel that he has a face of deepest, empathetic pity. And he never looks more heart-melting. As for the "mighty lord Frodo" essay, I really have been wrangling with this scene (and its RotK parallel) for years; I wrote reams on it in a TORc thread ("Frodo's Kitchen" - best Frodo discussion thread ever) way back when, wrestling with what I thought it meant. But I never could work it out to my satisfaction. I still haven't, but I feel like I'm getting closer. There is another scene at the Black Gate in which Sam is impressed by Frodo's self-assertion over Gollum, also involving the Ring (when Frodo strongly cautions Gollum not to ask to see the Ring again), but it doesn't include the same revelatory details or Frodo revealed as lordly and bright, and with Gollum as a little, low, whingeing sub-hobbit thing. I'll talk more about that scene when I get to it. It all goes to show how well Tolkien wrote these scenes that I should still be so engrossed. ... just had to get that in there. Whew! Mechtild, your perceptive analysis of the book chapter has thrown light on a passage from the book that has made me ponder for many years. Of course: it's the power of the RING. Blindingly obvious, really. Of course I connected this vision of Sam's, in which he seems to see Frodo and Gollum with other eyes, with the power that the Ring exerts. But I thought it had to do with Frodo's spiritual growth, the fact that Sam saw him as a 'mighty lord who hid his brightness in grey cloud' and Gollum as a 'little whining dog'. In other words, I saw this as benevolent: both Frodo and Gollum being revealed in their true colours, what they both had become, or in Frodo's case, was on his way to becoming. But how could that be? Frodo is not a mighty lord: he is a humble hobbit with a virtuous heart. You say: Frodo revealed as a mighty lord, and Gollum as a little whining dog, just doesn't sound like the revelation of anything good to me, not in a Tolkien story. The contrast is more extreme and more unmistakable in the Mt. Doom "transfiguration", but the same elements are present here. I really can't believe I've never seen this before: that it's the malevolent power of Sauron reaching out through the Ring and casting Frodo in Sauron's shadow. Because the Ring is an extension of Sauron's power and character. The Ring wraps Frodo round in a horrible cloud of delusion. And it has been the ruin of Gollum. 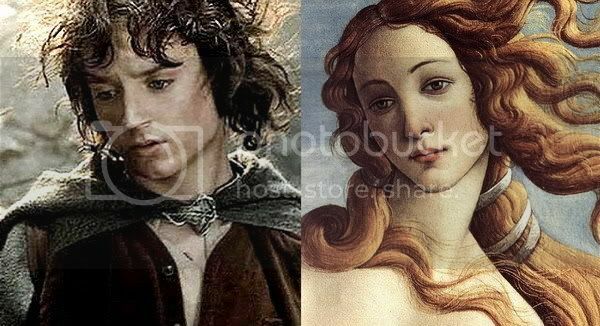 As for Film Frodo, he looks as if he could have been painted by Botticelli. LE SIGH!!!!!!!!! That's brilliant, Pearl: "as if he could have been painted by Botticelli". Thanks, Pearl, for your supportive comments. They mean a lot to me. As for this way of interpretating the "transfiguration scene"(s), as I mentioned to Peachy above, I've been thinking about the ambiguities in these scenes since Frodo's Kitchen. Ah, Frodo's Kitchen. :) I was always too busy with the Harem to get involved with the Kitchen! Ha. Yes, that Botticelli, right there! (And I've seen it for real too. It's utterly glorious.) Not that Frodo looks girly, or like Venus, you understand. *snort* As pretty as he is, he NEVER looks girly to me. Not with that nicely masculine jawline! No, it's simply the angle of the face, and Film Frodo's Renaissance features, that made me think of that particular painting. :) Thanks for posting the pic up ... I don't know how to include pics in replies to a comments thread. Well, I mostly missed Frodo's Kitchen, too. By the time I had read the thread and began to post in it, it was wheezing it's last breath. The last viable post was posted a month or two later. Shees. No, I didn't mean Frodo looked like a woman, and I know you didn't mean that, either. It's the grace, the classical beauty, the pose, the way the hair is lifted up and to the right. Very Renaissance-lovely. P.S. You've seen the Botticelli Venus rising from the foam on a seashell??? In person????? Where is it displayed? This is one of my favourite paintings. When Peachy mentioned The Pieta in her comment above, I too thought: YES! It's not the perfect match like with Botticelli, and Michelangelo's Mary in more inwardly, but again it's the classical features that make a certain resemblance. But good old Pearl. I had never thought to compare him to a Botticelli, whose people are usually so long and tall (including Venus), but she's right: the angle, the attitude, the mood all are similar. Thank you Mechling! For such beautiful screen caps and your spot on comments. Keep ‘em coming I don’t wish to be cured. Completely off topic - but I thought it would amuse you. You wrote: ‘By the time I had read the thread and began to post in it, it was wheezing it's last breath’. There is a descriptive Swedish expression for anything that is fading, going home, dying or going West. That's a great expression, Este! It reminds me of Groucho Marx saying (making a figure of speech related to opera), "It ain't over till the fat lady sings." He's *awfully* beautiful in these Emyn Muil scenes, I agree. Dust and dirt and weariness just make him look better. Those close-up’s take my breath away … heartmelting, especially the first ones. No. All of them. TTT … so many wonderful scenes with Frodo and Sam. Aragorn would say “I bow my head…” – and so do I. Go on this way, lovey. Don’t you ever stop. Aww, Julchen. You are always so nice, and so encouraging. I don't know how long I can keep it up, that's the truth. I think that's what's giving me the drive to try and get a lot of posts done. I'm going to be starting a full time job in three weeks. I haven't worked full time since before our daughter was born. Right now I only work 1/3 time. I will lose all the free time I have become accustomed to having, and am afraid I won't have time to write or post anymore -- certainly not the way I have. "Make hay while the sun shines," the saying goes in the U.S. That's what I intend to do! I know this too well. My full time job eats me up at the moment, there's so less time left for the beautiful things of life. But ... whenever there will be time I'll come and visit you at your personal Shire, my dear. As you say "Make hay while the sun shines" - Samwise couldn't have said it better, right? Take care, honey. I'm thinking of you.